Why do you chose Tomus-UNI Timing Grow Lamp ? For effective growth and health of plants, light is essential at every stage of development. If plants don¡¯t get enough light they become weak and may even die. Even light emitted by windows may not be enough to the plant and the best solution is to grow the seedlings under LED or fluorescent grow lights. Tomus-UNI Dual Head Led Grow Light with Timer hastens growth of indoor plants. With this specially designed USB plug-in plant grow light, you can be able to light your plants effectively. 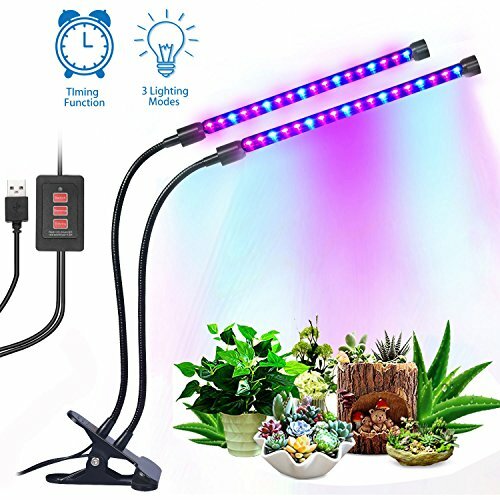 The timing function gives you a chance to set lighting time to 3, 6, or 12 hours and will automatically light the plants. It also allows you to regulate the brightness and distance between light and plants to suit every plant needs. It is important to note that it is a one-way timer and can be set to automatically turn off after 3, 6, or 12 hours and will need be manually turned on every day. - It is advisable to maintain a distance of 1.7 to 3.4 feet between the light and the plant. - This grow light should be exposed to the plant twice a day with each session lasting for 6 hours for effective growth. MULTIPLE USES - It is suitable for indoor plant seedlings grown in a hydroponic greenhouse at your home or you placed in your office. It helps to speed up the growth of potted plants, flowering plants, foliage, and succulent plants. BEST RED/BLUE LED COMBINATION - This LED grow lights diverts targeted wavelengths for plants. The 12 Blue LED chips ensure plants take in more energy through the synthesis of chlorophyll to help in germination. 24 Red LED chip contributes to effective germination, flowering, and enhances photosynthesis for better results. UPGRADED TIMER - it comes with three timer setting options which allows up to 3, 6, or 12 hours according to plant needs. This is a one-way timer whereby lights can automatically turn off after the stipulated time and you will need to turn it on manually. 5 DIMMABLE MODES & 3 SWITCH MODES - it has five dimmable modes to suit varied stages of plant growth. You can just switch the lights off or on to suit the plants need. ADJUSTABLE DESIGN - It has a USB connector which makes it convenient to connect to your office or home. With its 360 degrees adjustable gooseneck, it is able to light a wider area and emit light in any direction to provide energy to more plants. If you have any questions about this product by Tomus-UNI, contact us by completing and submitting the form below. If you are looking for a specif part number, please include it with your message.